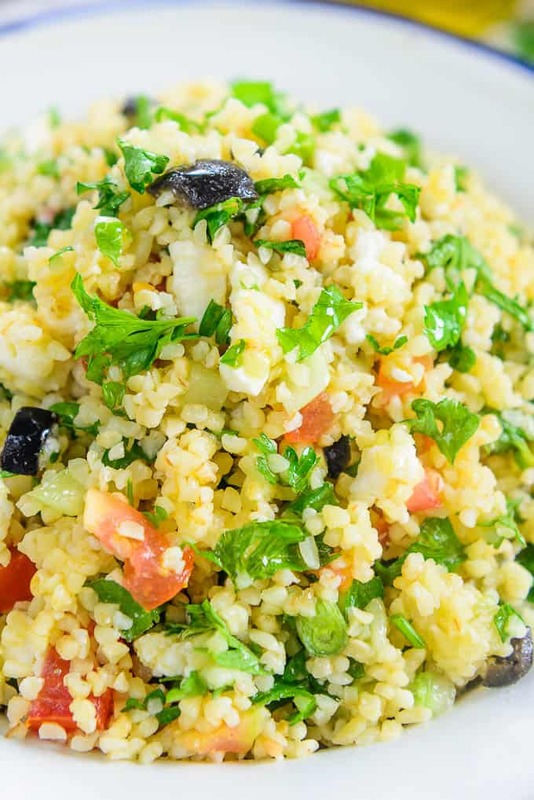 Tabouli Salad or Tabbouleh is a healthy Middle Eastern salad made using Bulgar Wheat. A lot of herbs are added to it for a refreshing flavour. Here is how to make Tabouli Salad in a traditional and easy way. Tabouli Salad or Tabbouleh is a Mediterranean side dish. Mainly, bulgur wheat (cracked wheat), a few cups of finely chopped veggies and herbs like mint and parsley are added to it. It is a very healthy salad to have for lunch or dinner. It is filling yet light on the stomach. In Levantine Arabic, the word ‘tabil’ means seasoning or dip. Therefore, this salad is often on the mezze platter. And, I so love it. Firstly, it is very healthy. Secondly, it has a great taste, texture as well. So, why not? Now, fresh parsley is the star of this dish. But, so are fresh mint, lemon and olive oil. Because these tabouli salad ingredients are the dressing. This grain is very forgiving and can be cooked in advance and refrigerated. Just toss it using a fork and it gets ready to use. To cook bulgar, all you have to do is soak it in boiling hot water and cover for 10-12 minutes. It absorbs all the water and gets ready to eat. You can use stock instead of water for more flavour. 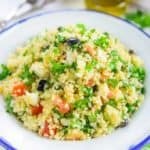 What to serve with Tabouli Salad? The best way to serve this salad is chilled on a mezze. It tastes fabulous with falafel, pita bread or pita bread chips. You can serve this salad on it’s own too as it’s quite filling. There are many variations of this salad. You may add Orzo, Cauliflower, Chickpea and Couscous to it if you want. Or make a Tabouli Quinoa Salad as well. How to make gluten free Tabouli Salad? To make gluten free tabouli, use quinoa instead of bulgar as it is a gluten free grain. Keep the remaining ingredients as it is. To make tabouli salad, use the best quality ingredients as the taste depends totally on the quality of ingredients used. I have used fine Bulgar to make this recipe. It has a nice bite to it and goes well with rest of the ingredients. To cook the bulgar, I have used chicken broth but if you are looking for a vegetarian version, you can use vegetable broth too. Use fresh parsley, mint leaves and spring onion greens for a refreshing flavour of your tabouli salad. I have also added chopped tomatoes and cucumber to he salad. They give a nice crunch to it. You can halved cherry tomatoes as well in the salad. For the dressing, I have used minced garlic, lemon juice, extra virgin olive oil and salt. Lastly, do not forget to top your salad with feta cheese and chopped Kalamata olives. Bring the chicken broth to a boil. Once it comes to a boil, switch off the heat and add bulgur in it. Cover the pan and let the bulgur soak all the broth and cook in it for 25 minutes. Once done, fluff the bulgur with a fork. Add parsley, tomatoes, cucumber, mint leaves and spring onion greens. Refrigerate for 30 minutes. 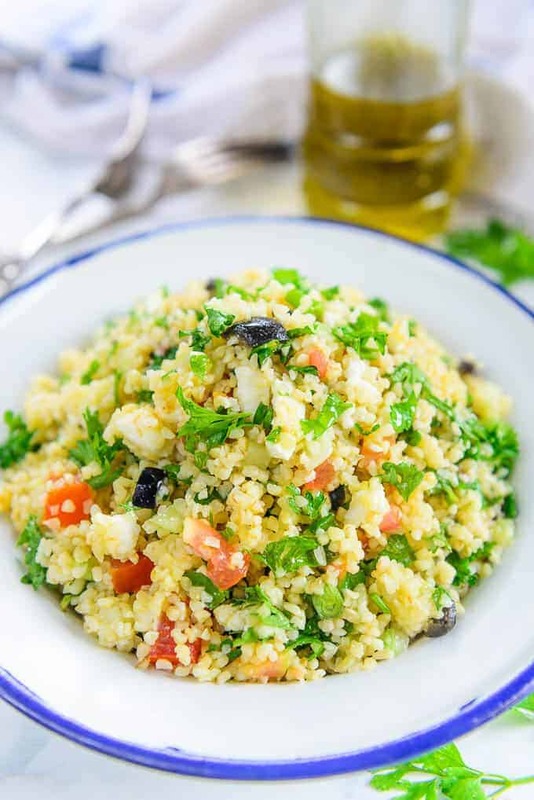 Tabouli Salad or Tabbouleh is a healthy Middle Eastern salad made using Bulgar Wheat. A lot of herbs are added to it for a refreshing flavour. Add parsley, tomatoes, cucumber, mint leaves and spring onion greens and mix well.